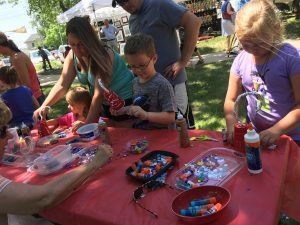 The next MacNider Arts Festival will be Saturday, June 8! 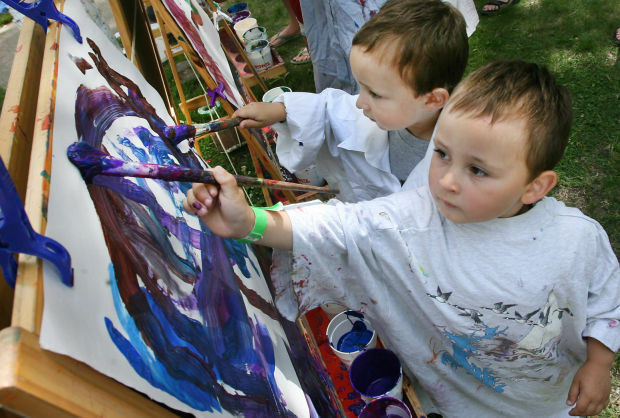 Arts activities for children, lively musical entertainment, great outdoor food, and long-time festival traditions are all a part of the fun. All events will be held on the lawns of the Museum and the adjacent Mason City Public Library at 303 2nd Street SE in Mason City and are open to the public. The Outdoor Art Market is open from 9 a.m. – 4 p.m. with many fine artists and crafts persons. This was a wonderful opportunity to meet amazingly talented artists, buy local & support art! The day will begin with the Mayor and City Council’s Pancake Breakfast at 9 a.m. This free breakfast is one of the most popular parts of the festival! Starting at 11 a.m. the Museum will sell food for festival goers to purchase. Proceeds of the food sales benefit the festival and Museum programming. Live music will be provided by the Mason City Municipal Band, Paul Christian, The Common Ground Company, and Juni West! Children’s activities will be offered from 9 a.m. to 5 p.m., and are free or a small fee. A variety of crafts will be available for different age groups, with volunteers on hand to assist. More than 200 area citizens are recruited to volunteer during Festival. If you are interested in volunteering during part of this event, contact the Museum at 641-421-3666. Principal, Cerro Gordo County Association of Independent Insurance Agents (1st Insurance Services; Edwards-Brandt & Associates; Ermer Insurance; First Gabrielson Insurance; Haines Insurance; Jaspersen Insurance), Iowa Arts Council (via operation grant), Clear Lake Bank & Trust, Burgmeier Dentistry, Central Park Dentistry, Clausen Plumbing & Heating, Country Meadow Place, Curries, Cutting Edge Investments, Dental Center of North Iowa, First Citizens Bank, Good Shepherd, Hank’s Plumbing, Hearing Associates PC, Kristy Marquis – State Farm , MetalCraft, North Iowa Community Credit Union, North Iowa Eye Clinic, North Iowa Golf, Pamela Little Inc., Plumb Supply, Raymond James Associates, Router 12 Networks, Schupick & Associates, Alyse Hesley-Thrivent, Jim & Amanda Ragan, Mike & Karen Byrne, Patricia Tomson, Marsha & Barry Cory, Ann & Byron Beasley, Catherine Beck, Tom & Becky Dettmer, Joyce Hanes, Angie Konrad, Paul & Barb MacGregor, Dianne & Arlo Stoltenberg, & the Generous People of North Iowa!